What is your Cash Flow Telling You? Your cash flow talks to you, right? Or is that just me? If month after month you continually see great profits in your business – meaning your P&L shows that nice positive number at the bottom, your checking account has a steady balance and your savings account is growing and has more than ever – great! Your cash flow is probably telling you that you’re doing it right! You’re probably tracking your income and expenses, you probably look for the best deals and you’ve probably got a great team that you collaborate with so you know you’re receiving the best value for the best price. But, just make sure that by seeing these great profits every month and having an awesome cash flow doesn’t mean you work a ridiculous amount of hours because you’re doing it all on your own and never taking a break (and probably not paying yourself enough) or even that you don’t spend a dime on anything extra even if it’s something awesome that would totally help your business. That’s not cool and after awhile you’re going to burn out anyways. If month after month you seem to break even and just make it by the skin of your teeth and you can’t wait until the next month so your account refreshes and you’ve got some cash flow again – you could probably make some improvements. It might be time to analyze the price you’re charging for your products and services vs. the cost it actually takes to produce the product or render the service. Make sure you have a decent profit margin there. Also, analyze your expenses and make sure everything is a necessity – if you’re paying a lot of money for an ad, make sure it’s bringing in clients. If you are still in the building stages of your business – hang in there – keep working on your business, track your cash flow and you’ll see continued growth. If month after month you are seeing negatives – this is not good. Negatives on your P&L, negatives in your bank account. What’s going on? It’s time to really analyze all parts of your business. Now, if you’re just starting out and you’ve had to invest a lot in products or something else to get off the ground, that’s understandable. However; if this keeps going on and you can’t seem to dig out of it then something’s gotta give. Are you tracking your income and expenses and reviewing your P&L to really see what’s going on? Are you being wise with your spending and seeking out the best deals? If not, analyze these things and make changes and I’ll bet you’ll see a difference. I’d love to know how you’re liking these blogs and tips that I post. Feel free to comment below and drop me a note to let me know if you’re enjoying the content. Hey! 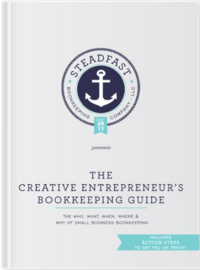 As a new business owner I am completely lost on even how to bookkeeping any advice!